Secondo un recentissimo studio, camminare riduce il rischio di ictus negli uomini anziani. La Ricerca, che ha coinvolto più di 3000 uomini sani tra i 60 e gli 80 anni, è durata più di 11 anni; periodo durante il quale i soggetti sono stati monitorati costantemente. I risultati sottolineano come sia importante mantenere uno stile di vita attivo, camminando almeno 7h a settimana. La passeggiata, dunque, sembrerebbe un fattore protettivo per ictus e, a leggere i dati forniti da questo lavoro, il miglioramento dei parametri biologici correla con le ore di passaggiata settimanali ma non con la velocità media di percorrenza. Protective Effect of Time Spent Walking on Risk of Stroke in Older Men. Jefferis BJ, Whincup PH, Papacosta O, Wannamethee SG. From the Department of Primary Care and Population Health (B.J.J., O.P., S.G.W.) and Physical Activity Research Group (B.J.J. ), UCL, London, United Kingdom; and Division of Population Health Sciences and Education, SGUL, London, United Kingdom (P.H.W.). Older adults have the highest risks of stroke and the lowest physical activity levels. It is important to quantify how walking (the predominant form of physical activity in older age) is associated with stroke. A total of 4252 men from a UK population-based cohort reported usual physical activity (regular walking, cycling, recreational activity, and sport) in 1998 to 2000. Nurses took fasting blood samples and made anthropometric measurements. Among 3435 ambulatory men free from cardiovascular disease and heart failure in 1998 to 2000, 195 first strokes occurred during 11-year follow-up. Men walked a median of 7 (interquartile range, 3-12) hours/wk; walking more hours was associated with lower heart rate, D-dimer, and higher forced expiratory volume in 1 second. Compared with men walking 0 to 3 hours/wk, men walking 4 to 7, 8 to 14, 15 to 21, and >22 hours had age- and region-adjusted hazard ratios (95% confidence intervals) for stroke of 0.89 (0.60-1.31), 0.63 (0.40-1.00), 0.68 (0.35-1.32), and 0.36 (0.14-0.91), respectively, P (trend)=0.006. Hazard ratios were somewhat attenuated by adjustment for established and novel risk markers (inflammatory and hemostatic markers and cardiac function [N-terminal pro-brain natriuretic peptide]) and walking pace, but linear trends remained. There was little evidence for a dose-response relationship between walking pace and stroke; comparing average pace or faster to a baseline of slow pace, the hazard ratio for stroke was 0.65 (95% confidence interval, 0.44-0.97), which was fully mediated by time spent walking. Time spent walking was associated with reduced risk of onset of stroke in dose-response fashion, independent of walking pace. 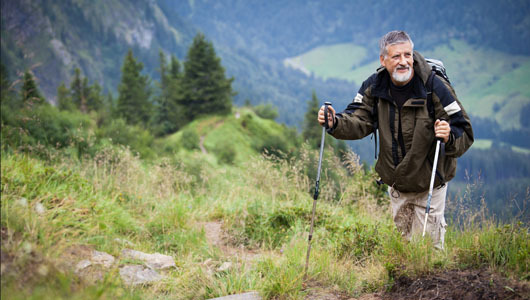 Walking could form an important part of stroke-prevention strategies in older people.